Abstracts: Aquaponics is a food production system that combines intensive aquaculture (raising aquatic animals in tanks) with hydroponics (cultivating plants in a nutrient solution). The nutrient rich effluents from the aquaculture component are circulated through the hydroponic component where a proportion of these nutrients are taken up by the plants before the water is returned to the fish tanks. 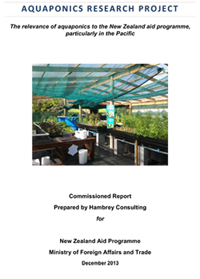 The technology of aquaponics has been with us since the 1960’s, but interest has increased rapidly in recent years due to widespread interest in local sustainable food initiatives, and awareness amongst development agencies that aquaponics may allow for the production of both vegetables and fish in water-deficient or soil-deficient zones. The technology is also of particular interest to aquaculture scientists as a possible tool for the reduction/remediation of nutrient waste from intensive aquaculture production.